Optimize your crystallization process at an early stage with only small amount of material. The Crystalline with through the vial analytical capabilities like turbidity, particle visualization or Raman is easy to set up and operate. The ergonomic design and effortless operation removes all the barriers to using technology which was previously only accessible to experts. The intuitive control and analysis software gives every user access to valuable information with small amounts of material. No insert probes into reaction vessel and no cross contamination. New software with improved research capabilities. Growth rate and dissolution measurements have never been so easy. Digital particle viewer, Real time Raman, Particle Size Distribution (PSD), Turbidity. 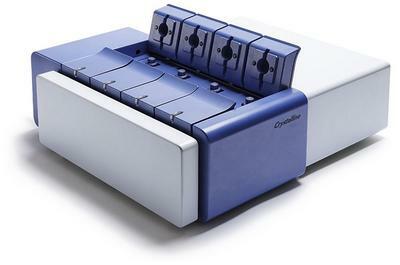 The modular design of the Crystalline allows for customization according to your individual needs and budget. You can combine turbidity information with a parallel particle viewer or with real time Raman capabilities. All of these techniques are integrated into a small reactor with overhead stirring and refluxing capabilities. Have you ever wondered what happend during crystallization?